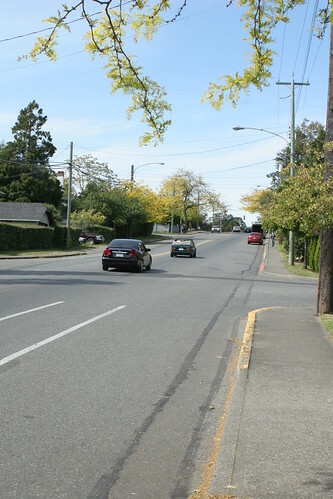 After much debate and staff time, there are some new bike lanes coming to Oak Bay. Likely early in the new year new paint will hit the road on Cedar Hill X. Rd, closing the gap between the Saanich border and the UVic entrance at Henderson. Like most politics, this win comes with a compromise: the northern side will only be a bike lane from 7am to 7pm, Monday to Frieday, just like the Henderson Rd. lanes. (The southern side is a full time bike lane). Slightly longer in the coming is anything on Foul Bay just before Lansdowne. Engineering staff didn’t feel that a bike box is warranted, nor do they feel it was safe, a discussion that slowed the whole process down. Engineering has yet to return a detailed design to council, a necessary first step to anything else being done. The drive for all this work came most recently from Councillor Jensen, who started the ball rolling in the early summer, before council ultimately choose to hand the matter to the Community Initiatives Committee (of which I am a member). The CIC ultimately produced a recommendation for both bike lanes on Cedar Hill X. Rd. and the Foul Bay at Lansdowne, but the second part has been longer in coming. Also coming in the new year is an RFP for an Active Transportation plan for the muncipality. A $20,000 project, the plan would be a first for Oak Bay, although the [download id=3] (PDF, pg 6-7) did make some specific recommendations as to improvements in 2009. All in all, things are moving, something I don’t think I could have honestly said or believed this time last year. The great disappearing bike lane on Foul Bay Rd. It seems those bike lane improvements I mentioned the other day might not be as slow as coming as I had feared. At the time council hesitated, asking for more information about traffic counts and resident feelings. The counting of cars has begun with the engineering department deploying a vehicle counter just south of Middowne and notifying the residents has apparently already happened, as I received in my inbox this notice (PDF) asking for their opinion. Adding a bike lane on Cedar Hill X Rd. between the Saanich border at the intersection with Gordon Head Rd. and the UVic entrance at Henderson Road. The deadline for getting information back to council is fairly short: you need to send in your comments by 4pm on Thursday, July 8th or by attending the meeting on the 12th of July at 7:30 pm. It will be held in the usual place at the Municipal Hall on at 2167 Oak Bay Ave. Thanks to Lesley Ewing for forwarding this on to me. Hope to see you all there. After a good half hour debate about the relative merits of adding bike lanes and bike boxes on two different routes to UVic, council ultimately decided to delay doing any work until Director of Engineering David Marshall could come back with more detailed engineering drawings, traffic counts at the Foul Bay intersection, and feedback from the local residents affected. For a quick review, as I reported two weeks back, Councillor Nils Jensen asked Marshall to look at adding a bike lane northbound on Foul Bay just before Lansdowne Rd with a bike box at the intersection itself as well as adding a bike lane on the western section of Cedar Hill X Rd to complete the existing lane that ends at the Saanich border. Marshall came back with three different designs: The first simply stripped the bike lane through the intersection, possibly with a coloured treatment in the middle for visibility. This was the option recommended by Marshall to council. The second added a bike box at the intersection and the third extended the bike lane all the up the curb, removing the right turn lane. Also completed was a quick count of cyclists, with 54 cyclists tallied headed northbound during peak hours a few weeks ago. Engineering staff also spoke to a few of them. Their main concern was with how the intersection shifted to the left as a bicyclist or car travelled northbound. This apparently low number of cyclists and their lack of concern was used by several council members as reasons for holding off doing any work. Given that neither UVic nor Camosun are in regular session, the numbers are deceivingly low. I also suspect that surveying now misses the inexperienced cyclists that appear in the early September, cyclists that are more likely to want bike lanes and bike boxes. At the end of the night, council ultimately opting to do nothing beyond asking Marshall for the more information. Hopefully the Community Initiatives Committee, of which I am a member, will meet again in the near future so that we can discuss these items and get some action before the summer ends and students return to class.